Set in China’s near future, a global economic crisis has apparently launched China into a new golden age. Things are rosy and no-one could be happier, except Little Xi. A former judge, Xi turned political activist after being stripped of her post, refusing to execute those who did not deserve it. Along with Zhang Dou, a man who notices his beloved has lost her soul after returning from a certain “treatment”, and travelling hippy Fang Cao Di, they know that a whole month has gone missing. Together, they enlist Old Chen, a former best-selling author with a writer’s block, who wakes up from this nationwide amnesia to find himself entangled in their audacious plan, to kidnap member of the politburo, and to find out, what exactly is going on in China. As with other pop-futura novels, such as World War Z, The Fat Years reads, at times, like socio-economic analysis, where the narrative is often shelved whilst the author shares his theories of macro economics. Combine this with the perculiar mixture of a US translator, and Chan’s particular syntax with the inflections found in of the original Chinese text, and the finished product is a little grating, the narrative voice forming half way between the venerable Burt Kwok and a New York Taxi Driver. I mention these all in advance, because after quite an exciting first page, there is a long slow burn before the story really starts. I got rather bored of reading Old Chen’s eulogy of the “good life” that is Beijing’s multiple western chain clothes stores and Starbucks produced travesties of traditional Chinese drinks. The recount of his past experiences seemed to lead to nowhere, and the introduction of characters such as tycoon Jian Lin and bureaucrat He Dong Sheng seemed rather shoehorned in. The first chapter is rambling, slow, and if Old Chen is indeed Chan Koonchung’s imagined older self, he seems to have a very low opinion of old age. The meander does serve a purpose, as we realize we are being given a view through the eyes of someone who has forgotten the lost month and is none the less, obliviously happy. When Fang Cao Di implores Chen to remember the lost month, Old Chen’s metaphor is a pleasingly open nod to science fiction. “It’s like this: you’re aliens from outer space who have accidentally landed on earth and can’t go home, and I’m an earthling who’s able to communicate with you. I’m your friend on this earth. Do you understand what I’m getting at? “I get it”, Fang said. “You’re a traitor among earth people”. Reading on, Chan’s array of outsider protagonists are strangely endearing. Life-loving Old Chen, often exasperated by the behaviour of those around him; beautiful, strong and earnest Little Xi; the freedom-loving Fang Cao Di who approaches the world with child-like wonder; and the resilient, self-taught guitarist Zhang Dou. Even He Dongsheng, the insomniac national leader who only falls asleep during propaganda movies is nicely rounded, and his lucid monologues on Chinese politics are neither glib party approved diatribes, nor audience pandering doomsay. He was wearing a beige trench coat of the sort worn by the Hong Kong comic actor Ng Man Tat when playing a private detective, or Law Kar-ying in the role of the sexual deviant, a flasher. Obviously, Old Chen was not at all thinking of himself in this light. In his mind, when he put on his trench coat he looked more like Hollywood tough guy Humphrey Bogart or the author Graham Greene. Because of this misperception, when Old Chen nervously showed himself to greet Big Sister Song, she screamed in fright. Chan’s language is always richly humorous, when Old Chen talks about Wen Lan, his allegory is crass, but to the point, “it doesn’t matter whether she’s a made-in-China kerosene lamp or a French crystal chandelier, she’s still on the market, always on the make, and she still has her price”. Refreshingly, the book does not take the “everything in China in awful” approach that has become so much the stock-in-trade of Oriental writers in the West, partly because the author actually has personal experience of the country, being raised in Shanghai, and now living in Beijing. Chan sets out the reality of ruling a nation so vast, with such a complex past and bizarre set of developments as China. He proposes the view that order is better than chaos, and controlled stability is better than the freedom of anarchy. Ironically, for a nation so critized for its undemocratic and totalitarian system of government, Chan quotes an awful lot of western sources to which the Chinese turn for policy inspiration, from Hobbes’ Leviathan to President Roosevelt’s WWII economic policies. When we finally reach the narrative’s big reveal, and the mystery of the missing month is about to be explained, we are sat down and treated to fifty, yes, Five-Oh, pages of detailed analysis of just how critical China’s domestic situation was during the global crisis, the model for solution and changes in China’s foreign policy, the engineering of growth in domestic spending, a solution to China’s peasant land ownership issues…, and as interesting as I found this fresh and open thinking, I was getting impatient for the dystopian ending the novel had promised. When it finally arrived, it delivered the punch I had been steeling myself for, but also a sneaky uppercut that caught me totally off guard. Not only does The Fat Years demonstrate just how powerful the Chinese government could be, but the incredible things that people can do to themselves. 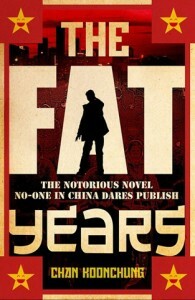 I am very glad I found The Fat Years, and despite this paperback copy playing on it’s “Banned” status, I found it far more balanced than a lot of titles held up as gateways to Chinese culture. Now that I’ve got through the narrative I may go back to reread and ruminate on the interjected economic and political commentary. Although the socio-economic detail tended to interrupt the flow, the story itself held through, its colourful characters and remarkably honest black comedy certainly lifted it from the crowd. The book is quite cinematic in places, and I do believe that a film of it would definitely be worth watching.